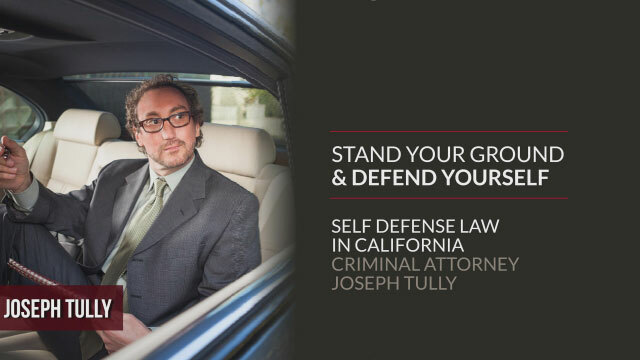 California Criminal Lawyer Joseph Tully known for his ground breaking Stand Your Ground self defense victory in Contra Costa County California, looks at how a person charged with a violent crime might use self defense as a complete defense to a charge of murder, battery, or other violent crime. Joseph Tully also shares the new Stand Your Ground self defense rules and realities. You’ve likely heard of self-defense as it relates to criminal cases. I think the first example that everybody thinks of when they think of self-defense that is used in law or in a courtroom is perhaps a bar fight, where you have one person drinking, watching a football game, and another group of people at the other end of the bar come over and start arguing about the football game. Before you know it, punches are thrown and the case ends up in court. But, self-defense can also be used in domestic violence cases as well. A lot of times we only hear about the most horrible, heinous cases on the news about one person viciously attacking another defenseless person but there is an old expression; ‘It takes two to tango’. Usually if there’s a domestic violence incident in a home, it’s not one sided, despite what the press might have us believe. However, when self-defense becomes really important to understand the nuances, the ins and the outs of it, are in cases of murder, attempted murder, gun charges; things of that nature. We’ve all heard the phrase ‘Stand Your Ground’ which was popularized infamously in the George Zimmerman Trayvon Martin case in Florida. The term ‘Stand Your Ground’ and self-defense was also very important in the precedent setting case I successfully tried in Contra Costa County, California; People v. Madrona, where a homeowner was forced to shoot at a teenager who was coming at him with a trash can. Realities of Self Defense as a Complete Defense to a Crime: What is Reasonable? Regardless of the case, the law on self-defense eventually comes down to what is reasonable. There’s no bright line, there’s no law on the books that says ‘this is reasonable, that is reasonable’. It all boils down to what a jury of your peers would think is reasonable. The prosecution would argue that the actions were not reasonable self-defense, and your criminal lawyer points out facts to the jury that would prove that your actions were reasonable self-defense. There are some mechanics of the California law that do apply in every case; one is that self-defence doesn’t mean you can’t strike first. Again, if somebody is running at you, if somebody is threatening you with a weapon, if somebody flinches at you or you reasonably believe they are going to cause you imminent harm you can defend yourself. You don’t need to wait to be physically attacked before you can defend yourself. The second thing is the concept behind ‘Stand Your Ground’, which really just boils down to: you don’t have to run away. You can stand your ground and reasonably defend yourself. The third thing, in California you can reasonably pursue an assailant. You can reasonably pursue anyone you think is going to do you harm. Again, everything having to do with self-defense comes down to what is reasonable. To judge what is reasonable, every single case is going to be different, every single fact and circumstance is going to be different in every situation. When & Why Do You Need a California Criminal Lawyer? A qualified lawyer will ideally help avoid some pain and sometimes get the charges dropped completely. You also want to be cautious when talking to an attorney because felony cases have two parts to them; they have a preliminary part and a jury trial part. The jury trial part comes after the preliminary part and that’s really where all the high stakes are. You want to make sure when you are talking to an attorney that they are prepared to represent you through the entirety of the case, and not just for the preliminary part. I think you need to look at who this attorney is that you’re sitting across from, where their heart is. Are they going to put everything in it to defend you? That’s what you want to look for. You want to look for someone who is going to have your back, not someone who is afraid to make waves. If you want to know if your own self defense claim will help you in California, you will need to speak with a criminal attorney who can review the specific facts and circumstances of your case and give you an opinion. I hope that this has been helpful and informative to you, and I wish you the best of luck. I’m Joseph Tully, a certified specialist in criminal law in the State of California.